I am always deeply touched by this quote from Rumi. I love this sense of connecting with each other from a place of openness and non-judgement. Where we can relax and be ourselves, letting go of preconceived ideas of how we “should” be or “ought” to do things. All my teachings are an invitation to meet you in this space. Where you can explore how your body moves with a sense of curiosity and play and where you can come to rest into stillness, welcoming yourself just as you are. Because it is in the felt sense inside our body where we can begin to unravel the tensions in our body mind patterns. As the Somatic Educator Thomas Hanna said “if you can feel it and sense it, you can change it”. Hi, I’m Jahna and I’d like to welcome you here. For many years now I have studied Yoga and Psychology and more recently Somatics, seeking out and learning from world renowned teachers in their field. As I embody all that I learn, my passion is to share this with you. So that you can experience a sense of well-being and ease in your body and mind and as you go about your life. I’ve always been curious about people and love to dive in deep to things. That’s probably why I studied Psychology and worked for many years as a Clinical Psychologist. I loved helping people make sense of the stories of their lives in a way that honoured and empowered them. But I often felt that the body was left out of the conversation. And my own body was trying to tell its story…I had been experiencing chronic neck and shoulder tension and decided to take up Yoga to see if it would help and as a way to de-stress. I was amazed at how good I felt in my body after a class and how my mind felt so much calmer. So began my life-long love with this ancient wise practice called Yoga. However, when I reached my mid-late forties I realised my practice needed to evolve to meet my changing needs in body and mind. I yearned for a gentler, more embodied approach whereby I could experience the poses from the inside out. This led me to the teachings of renowned Yoga teacher Donna Farhi. An approach that has (and continues to do so) deeply nourished me on so many levels. I noticed how long held tension in my muscles released, as my posture improved and my breath became more easeful. But it wasn’t just a physical change I experienced, over time I found myself becoming more grounded and centred, able to respond to the ups and downs of life with more grace. Don’t get me wrong, this doesn’t mean I am calm and tranquil all the time. No, I continue to experience the full range of emotions that make us human just as I imagine you do too. And I make mistakes and am critical of myself at times. But when I welcome in my experience just as it is, I find a sense of ease and equanimity within me no matter what is happening in my life. This welcoming of life just as it is without judgement is the foundation of iRest Yoga Nidra a meditative practice that I have truly come to cherish for its ability to induce a profound sense of deep rest and healing within me. Jahna is a fantastic and experienced teacher for all levels. She explains the muscle and bone movements underpinning the yoga postures. She is calm and gives clear instruction and explanations. Jahna’s classes are relaxing and you feel much more supple and toned afterwards. When one of my teachers introduced me to Somatics, I was so excited because it felt like the missing piece of the puzzle to my chronic muscle tension finally fell into place. I absolutely love how these gentle, mindful movements are so effective at releasing tight muscles (which are often the cause of muscle pain and stiffness) leaving you feeling so relaxed in your body. If you’re curious, you can find out more about what makes them so effective here (hint: it’s to do with your amazing brain!). I had gone to other yoga classes and I was finding them too demanding and not right for my body. What I love about this class is that I can go at my own pace and have time to feel into my body which means I’m more relaxed and supple afterwards. I feel more fluid in my body and my posture has really improved. The class would suit anyone who wants to go slowly and explore how their body moves and breaths in different yoga postures. It wouldn’t suit someone who want’s a ‘real workout’. Jahna holds a space that makes you feel safe to go at your own pace. It’s great if you have stiffness or aches and pains because it will gently help you improve your suppleness. If you feel drawn, come along and experience just how relaxed and at ease you can feel in body and mind. I started Yoga over 20 years ago as a way to look after my body and de-stress. I fell in love with this ancient, wise practice and in 2004 I qualified as a Yoga teacher within the Iyengar tradition. I later discovered the profound teachings of world renowned Yoga teacher Donna Farhi and felt so inspired and nourished by her approach that in 2012 I completed her Advanced Teacher Training. My teaching is inspired by what I have learnt and embodied from Donna and I continue to study with her and have assisted at her workshops. I am also extremely grateful for the wonderful teachings of Lisa Petersen (co-teacher on Donna’s training) and have also assisted on her Advanced Teacher Training. 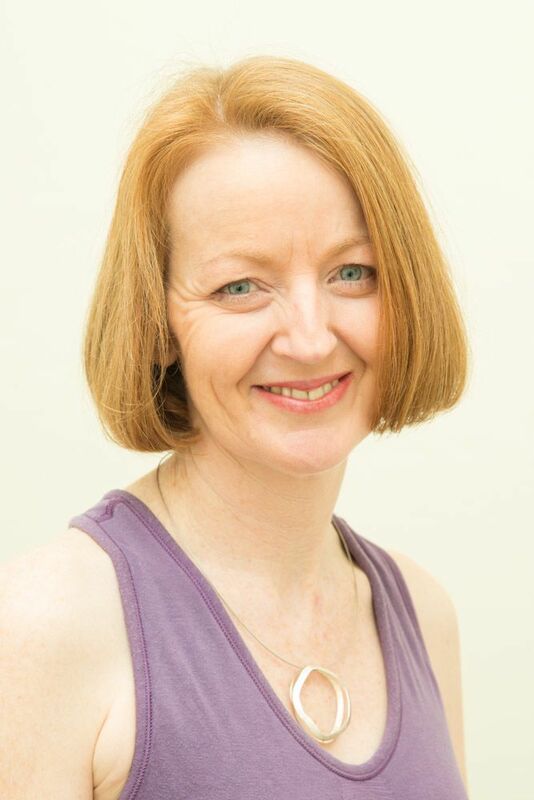 In 2014 I qualified as a Somatics Exercise Coach (in the Hanna tradition) with Martha Perterson (Hanna Somatic Educator), a leading expert in pain relief through movement and in 2015 I began her 3 year in-depth training in Clinical Somatic Education. I have been practising Yoga Nidra for a number of years and through Richard Miller’s Integrative Restoration Institute have trained as an iRest Level 1 Teacher-In-Training. In the past, I worked as a Clinical Psychologist within the Health Service for over 20 years. I love to live a fairly simple life, enjoying time with loved ones, going for walks in nature and I like nothing better than curling up with a good book in front of the fire. I am a big fan of tennis and I definitely don’t get out of the house enough when Wimbledon is on! My favourite meal of the day is breakfast and I absolutely love my homemade porridge (strange but true, I do live in Scotland you know) and I’m a real homebody who could potter about for hours given half the chance.